Little is more important to the stereotypical sorority girl than her hair. SAU’s Marissa Aranda broke down that label by putting her long, brown hair on the chopping block in a Phi Mu fundraising effort that raised more than $10,000 and earned national media attention. Aranda’s head was shaved September 28, 2013, in downtown Little Rock. The SAU Phi Mu chapter and the Greater Little Rock Alumni Chapter of Phi Mu were thrilled to surpass their $7,500 goal. 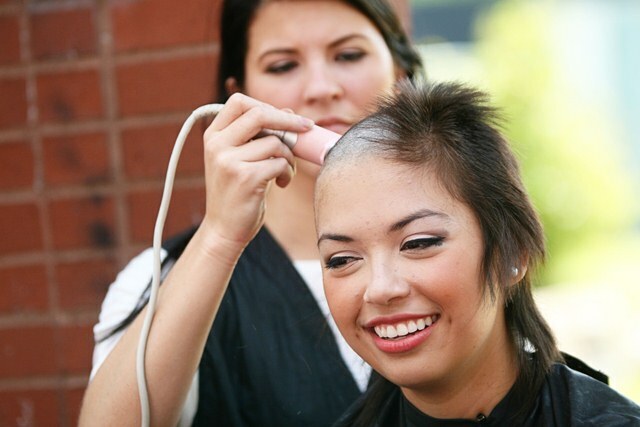 Their “head shaving for a cause” effort benefitted childhood cancer awareness. “It was really amazing that people could come together in such a short amount of time to raise what we needed,” said Aranda, senior Spanish education major. As her hair was segmented into four long braids, cut, then her head shaved, Aranda had the support of Elijah Talley, 12, who has battled cancer for eight years of his life. The money raised is being donated to the Children’s Miracle Network and to the American Childhood Cancer Organization of Arkansas in honor of Elijah and Creed Foster, 5. Creed could not attend the head shaving event as he had to be readmitted into Arkansas Children’s Hospital. Aranda was sporting a hat and a smile on the SAU campus the Monday following the shaving. She said she enjoyed the extra sleep allowed to her now that fixing her hair was not a part of her morning routine. Norma Aranda, Marissa’s younger sister and a sophomore social work student at SAU, made news earlier in 2013. She earned the Miss Arkansas Latina crown late in 2012, which earned her the opportunity to compete for Miss Latina U.S. in August. She placed in the top ten at the international competition held at Barceló Maya Beach Resort in Cancun, Mexico.